Over 30 years of Proven Technology. The Newman Roller Frame surpasses any other frame system on the market today. Article: It's all in the Screen! 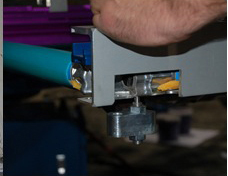 The Newman Roller Master designed for Quick, Efficient, and Precise Stretching of Newman Roller Frames. 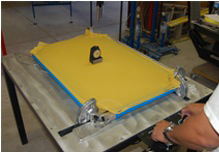 Take the variable out of your squeegee with the Newman Constant-Force Squeegee. Rotate and inject ink at high speeds with the Newman Flood Bars. Newman Roller Frames for Graphics, Industrial, and Large Format Applications. 25% to 50% stronger than most other mesh brands. Time is money. Reduce your press set-up time by 50% or more! The proven, Newman PinLock Registration System. See Videos and Tips on how to use our products. Don Newman discusses the topic of screen tension and why it's so crucial in the screen printing process. Industry consultant Lon Winters is president of Print This, Inc. and Graphic Elephants, LLC. During more than twenty years in screen printing, he has won more than 40 international industry awards. Since first speaking in 1980, Charlie Taublieb has conducted hundreds of seminars and workshops at trade shows for ISS, SGIA and DAX in the US. He also does Charlie’s Corner and speaks at shows for PSI, and TV TecStyle Visions in Germany, CO/CT in France and FESPA in Mexico, Europe and Asia.